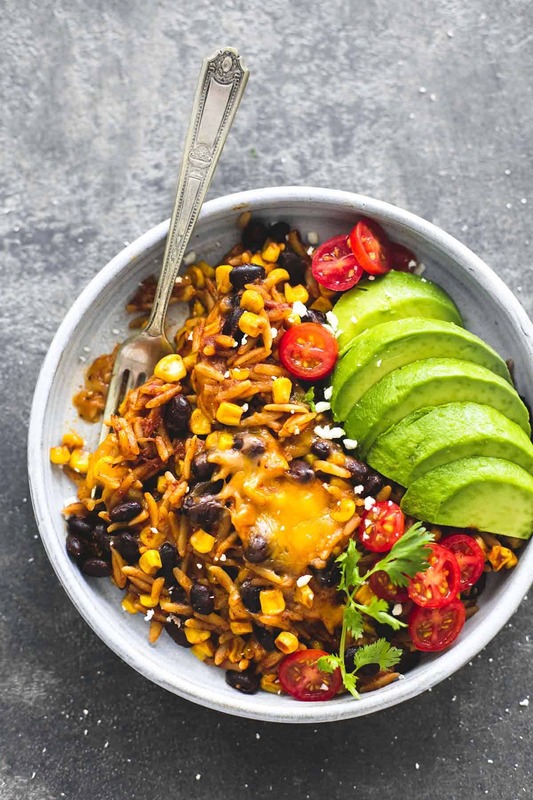 A single dish is all you need to fix this flavorful one pot enchilada orzo and make it an instant family favorite. This is my comfort food. 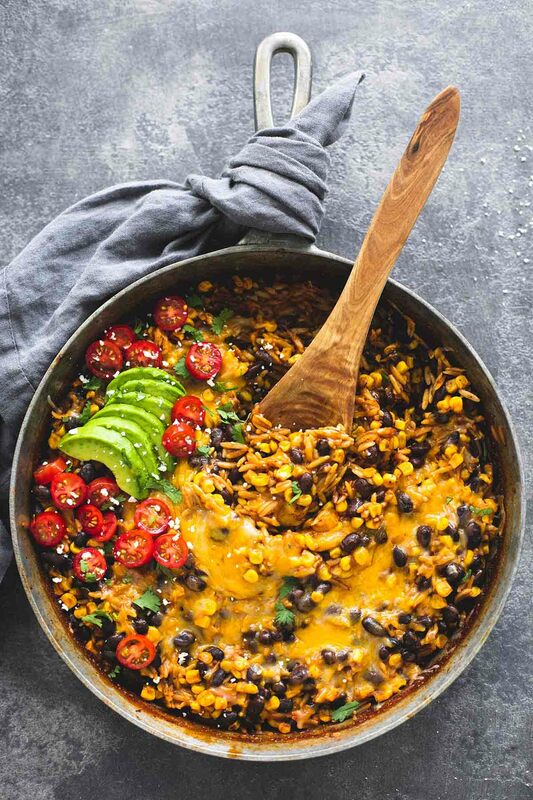 This one pot, Mexi-flare, 30 minute yumminess. For some people it’s bread, for some it’s mashed potatoes, other’s it’s creamy Italian pasta. For me? Cheesy, saucy, enchilada-inspired goodness I can heap into a bowl, top with all of my favorite fixins, and douse with hot sauce galore. No but really. Hot sauce G A L O R E.
I would curl up in my sweat pants on the couch with a ginormous bowl of enchilada orzo and watch Grey’s Anatomy re-runs every single night if I wasn’t feeding people besides myself. Because other people seem to get sick of eating the same thing over and over and over. So weird…..
I’m not completely unreasonable, I’d swap out the avocado slices for guacamole on night three if that helps?? Leftovers are my plan B. 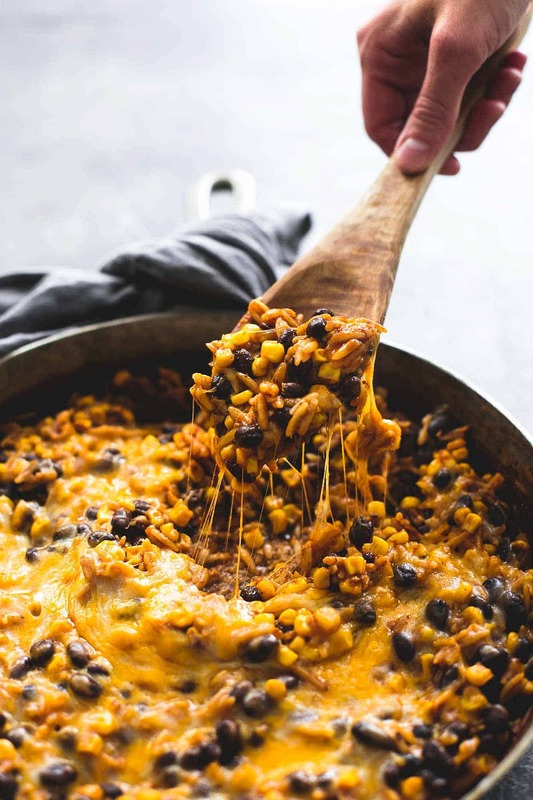 This recipe makes a pretty sizable batch of enchilada orzo and if you’re feeding only 2-3 people, like I am, you’ll have leftovers for a couple of days which means >LUNCH PLANS< for you. If you’re feeding a larger group, you likely won’t have leftovers – sorry but it’s just too good, no one will give up their portion for your said lunch plans. But this dish is so darn easy, with hardly any prep and only one pot to clean up, you won’t mind one little bit putting it on the weekly rotation. 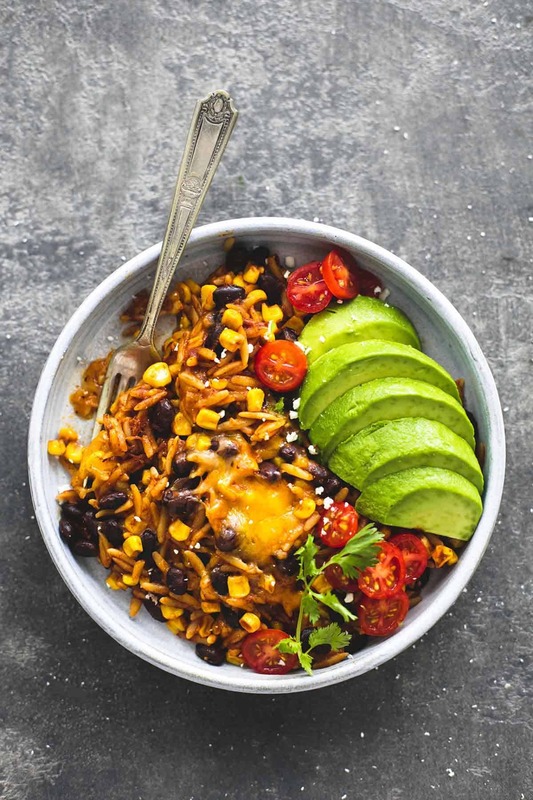 A single dish is all you need to fix this flavorful one pan enchilada orzo and make it an instant family favorite. Combine orzo, broth, enchilada sauce, corn, beans, and seasonings in a large nonstick (or well-greased) pot and sitr to combine. Cover and cook over medium-low heat 20-25 minutes, until liquid is absorbed and orzo is tender. Uncover, stir, and sprinkle cheese over the top. Cover again and allow to cook 1-2 minutes until cheese is melted. Add any desired toppings and serve. 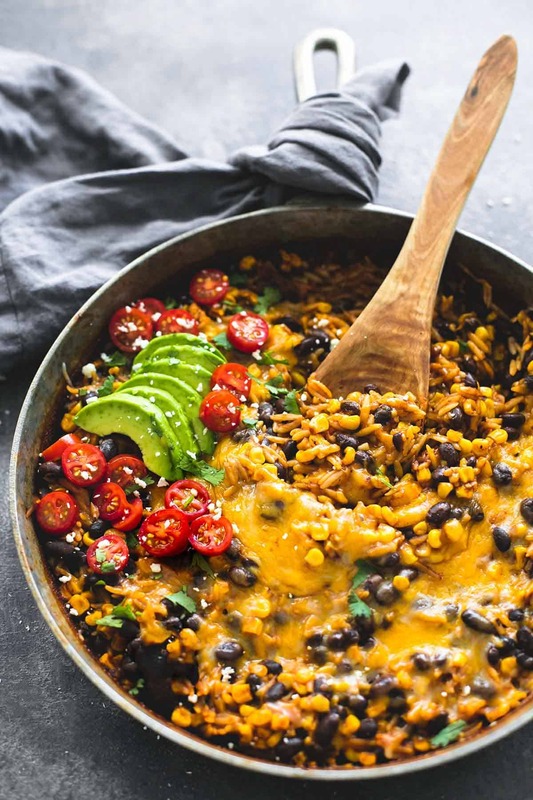 Try these other One Pot Recipes you'll love! Hey girl this is right up my alley! I love Mexican food to! Yummy for my tummy! This would be so great for those hectic weeknights! I’m saving this one! I m this recipe last night, but I substituted rice for orzo, and it was so good!!! Thank you for sharing your recipes!!!!! I made this last week while my husband was away (he hates Mexican food which makes no sense to me because I LOVE Mexican food!) Anyways, this was SO good. It had really good flavor, and I loved the leftovers! I will definitely be making this again! I just made this for dinner and it was so good!! I usually don’t enjoy leftovers but I can’t wait to eat this again tomorrow! I would only do 1/2tsp salt to start and the try. 1tsp was too much. I made this last night and I am blown away by its simplicity. It’s a super delicious, cheap, easy one-pot meal – what more could you ask for?! My only deviation from the recipe is that I cooked mine at a bit of a higher temperature since low-medium wasn’t cooking the orzo well in the 25 minutes (I think it’s my stove). Overall, I loved it though and will definitely make it again! this looks delicious but I really don’t like corn! I know I could just leave it out but do you have any ideas for a good substitute? Made this today and it turned out so soupy!! Anyone else experience this? The orzo plumped up but there was still so much extra liquid. Used 2 cups chicken broth & 2 cans enchilada sauce. I thought this was great! I meal prepped it a few times now. I added chicken and this week I am going to try replacing the orzo with quinoa, just an experiment. This is so perfect for weekly meal preps! It’s great reheated and delicious. Amazing recipe! This is now a staple in our house. it has all the flavors of enchiladas without all the work, sometimes we throw in some chicken or just eat as is. Thank you! I made this tonight and it did not turn out anything like the picture. I follow the recipe to a t and it turned out more like soup!!! 2 15 oz can of enchilada sauce is a lot of sauce…nearly a litre…plus 2 cups of broth?! i knew it was going to end up soupy…thats like 6 cups of liquid to 1 cup of orzo….something isn’t right….it tastes good enough, but i had to cook another cup of orzo so that i had something to put this soupy mixture onto. Same here, what the heck? I added an extra 1/2 cup orzo and cooked it higher than the medium-low specified after reading the comments here but it’s still soupy/mushy. plus, shouldn’t it be much more red than her picture after 2 cans of enchilada sauce? bummer. Not making this one again. This was super delish, but like some other comments have said, this recipe calls for waaaaaay too much liquid. I added a ton more orzo and ended up with lots of leftovers… not mad, but just a warning. Thank you for this super fast and easy recipe. I agree with some of the others to increase the amount of orzo, mine was a bit soupy as well. I’d also recommend not adding any salt, it was a tad salty. but overall I will make this again with the revisions. SO DELICIOUS!!! instead of 2 15oz cans of enchilada sauce I used 2 cans of 10oz sauce. I also used only 1 1/4 cups of broth. Came out a tad soupy but i added ground chicken to the pan (we’re a meat and potatoes kind of household), and the consistency was PERFECT!! My boyfriend loved it so much he’s already asked me to make it twice in the same week! Ugh I was so disappointed with this! Don’t get me wrong- it made my house smell delicious but it turned out way too liquidy. as i was mixing in the broth & enchilada sauce I had a feeling it was going to be too much liquid… unfortunately, i was right. please update the recipe with the correct measurements because i would love to attempt this again! I just made it right now and it was perfect! the others saying there was too much liquid, i think maybe they had the flame too low so it would take longer to cook. I love love this recipe. I make it all the time. I do find that I need to almost double the orzo in order for it to absorb all the liquid. But I love that I can doctor it a little depending on what I’ve got in my pantry at the time. Great recipe!